conceptualisation of a world wherein human's interaction with computer technology would no longer be limited to conventional input and output devices, has now been translated into a reality with human's constant interaction with multiple interconnected computers and sensors embedded in rooms, furniture, clothes, tools, and other items that surround them. Moreover, young people's inclinations towards wireless and mobile technologies has lead researchers to propose that the use of mobile/internet learning helps in reducing both time and location constraints within the educational environment. Thus, the present study attempts to explore the critical factors that help students in adopting ubiquitous internet (u-internet) in India. A questionnaire in English was developed and data were collected from 134 students in different majors at a large Indian central university using convenience sampling technique. In order to test the reliability of the developed instrument and extract factors related to it, statistical techniques such as Cronbach's Alpha reliability test, exploratory factor analysis, symmetric measures and correlation analysis were carried out. Preliminary analysis indicates that in terms of internal consistency/reliability, the developed scale in India performed satisfactorily. The EFA findings shows that 12-item scale can be categorized into 4 different factors. Thus, the four factors were named as “efficiency”; “information”; “performance” & “techno”. Standard loadings on each item was more than 0.550. Further, high and strong level of correlation was observed between the derived factors. In today’s era, internet connects more than two billion people across the globe immensely influencing the global economy by contributing an estimated $1.7 trillion (just under 3% of global GDP) in 2010 (McKinsey Global Institute Report, 2011). Yet half the number of internet users live outside the advanced economies, often in countries that are emerging fast, have significant economic potential and are socially and culturally diverse such as India. India’s base of about 120 million internet users is currently the third-largest in the world (Dhawan, 2012; Mohinta, 2013; McKinsey & Company, 2012) and likely to become second largest base by 2015 offering a remarkable example of the Internet’s growth potential (McKinsey Global Institute Report, 2011). Though, Indian users spend less time online per capita, their pattern of online behaviour is rapidly converging with that of users in more developed countries (McKinsey & Company, 2012). The internet’s role in communication, social networking, and information influencing India’s consumers in categories such as apparel, books, financial services and travel categories can easily be compared to those in developed economies e.g. Germany, Japan, United States (McKinsey & Company, 2012) and even many developing nations like Brazil and Russia (Mohinta, 2013). Projection of Internet users in India by 2015. Source: Adapted from McKinsey & Company (2012). The word “ubiquitous” can be defined as an “existing or being everywhere at the same time,” (Merriam-Webster) “appearing or found everywhere,” (Oxford Dictionaries) and “seeming to be everywhere” (Cambridge Dictionaries Online). When applying this concept to technology, the term ubiquitous implies that technology connects everything to everything else, where anywhere can potentially be contacted from anywhere else, and where everybody could conceivably interact with anybody (and anything) else (Bohn et al., 2004; Rao, 2012). European Union Commission defined u-internet as a key enabling technology of the information society. Moreover with proliferation of mobile devices in the following years, there is a high prospect that internet users with mobile/wireless access e.g. PDAs, laptops, cellphones, cordless etc., will surpass users with fixed-line connections e.g. desktop. 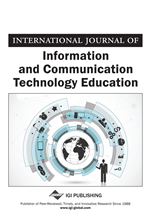 Consequently, Spurlin & Voorhees (2007) defined ubiquitous technology in education as teachers and students having an access to technology whenever and wherever they need it. Thus, ubiquitous technology is often wireless, mobile, and networked, making its users more connected to the world around them and the people in it.